How to Get from Lisbon Airport to Sines? Are you visiting Portugal? If you want to visit Sines, most likely you will arrive at Lisbon airport. To appreciate a comfortable transition from the Lisbon airport to your destination you should book a private Lisbon airport transfer to Sines avoiding all the hassle of public transports. In about 105 minutes you will be appreciating all tranquility that Sines has to offer. Select Sines as your transfer destination area and provide us with flight details, Sines accommodation address and contact. We automatically process your request for transport availability to Sines and send a booking voucher with your transfer confirmation in a matter of seconds. At Lisbon Airport arrivals terminal a friendly driver will be waiting for you next to a placard with our website logo. For the return transfer we will pick you up from the same address in Sines. And remember, you can always pay later to the driver for both your arrival and return Sines transfer. How far is Sines from Lisbon Airport? How much will it cost? How long? The travel distance between Lisbon Airport and Sines is 160Km and transfer time takes approximatly 105mins under normal traffic conditions. If you are looking for an easy, faster, affordable and hassle free alternative transport to Sines, the private Lisbon taxi transfer is the best choice. You will have a friendly driver waiting for you that will assist you with all of your luggage and guide you to your assigned transfer vehicle. While you are comfortable accommodate you can appreciate the beautiful plains that are a constant in Alentejo landscape and in about 105 minutes you will be at your destination. Enjoy! Alentejo well known city, Sines is located exactly in the center of Portugal southwest coast, integrated in the Alentejo South-west Natural Park and Vicentina Coast. In the picturesque village of Porto Covo you can appreciate one of the most beautiful and protected beaches in Portugal. 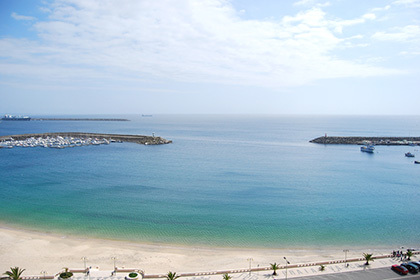 Sines has the main port in the ibero-atlantic front featured by its open deep-water sea with excellent maritime access. It is a place of unique diversity in an exciting landscape: long scarps, little beaches, dunes, heath and mountains. Sines is also a historical birthplace of the well known portuguese navigator, Vasco da Gama, who found the maritime route to India. It is a place for everyone, from families to the most adventurous. In Sines area, our private transfer service will transport you directly to and from any hotel, resort or private holiday villas/apartments. Take a look at our full list of taxi transfers fares & prices to see all the covered locations in the Alentejo and pre-book taxi transfers from Lisbon airport to Sines or other near by destination.